In response to the Tip of the Week from December 18, 2018, dealing with yarnovers and multiple yarn overs and how to handle them on the following row. 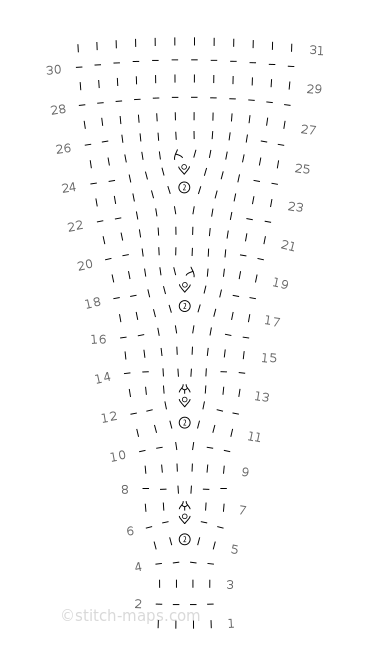 Assuming that the double yarnover is done on a RS, and assuming that the next RS row is at least partly stockinette, it may be worth working p-yo-p in the double yarnover, then reducing those three stitches to two in the next RS row. 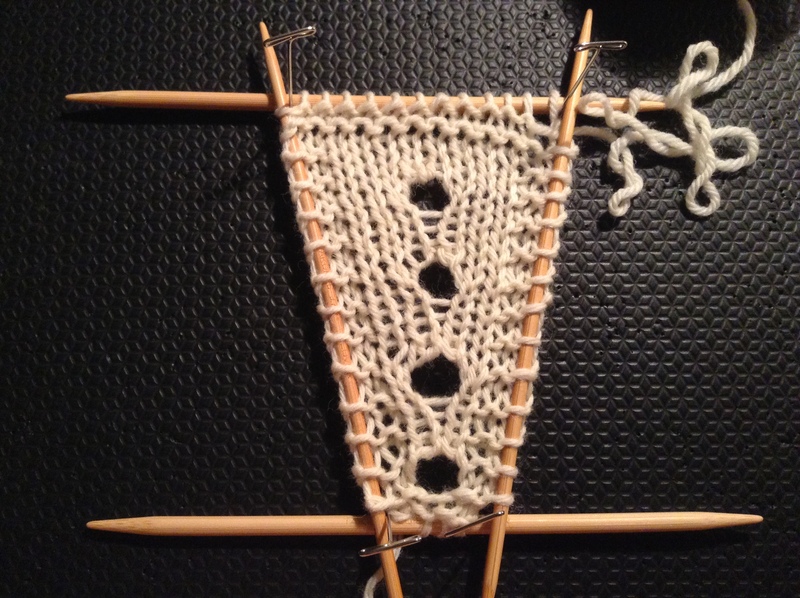 The end result is an optical illusion of two knit stitches emerging smoothly out of a single yarnover. No tbl twists, no knit-and-purl twining. Just two pure columns of stockinette. Magic. Shown with a cast-on count of 4 stitches. Rows 1, 3, 9, 15, 21, 27, 29, and 31 (RS): Knit. Rows 2, 4, 28, and 30: Knit. Row 5: K2, yo wrapping yarn twice, k2 (5 sts). Row 6: K2, (p1, yo, p1) in next st, k2 (7 sts). Row 7: K2, bunny ears back dec, k2 (6 sts). Rows 8, 10, 14, 16, 20, 22, and 26: K2, purl to last 2 sts, k2. Row 11: K3, yo wrapping yarn twice, k3 (7 sts). Row 12: K2, p1, (p1, yo, p1) in next st, p1, k2 (9 sts). Row 13: K3, bunny ears back dec, k3 (8 sts). Row 17: K4, yo wrapping yarn twice, k4 (9 sts). Row 18: K2, p2, (p1, yo, p1) in next st, p2, k2 (11 sts). Row 19: K4, ssk, k1, k4 (10 sts). Row 23: K5, yo wrapping yarn twice, k5 (11 sts). Row 24: K2, p3, (p1, yo, p1) in next st, p3, k2 (13 sts). Row 25: K5, k1, k2tog, k5 (12 sts).